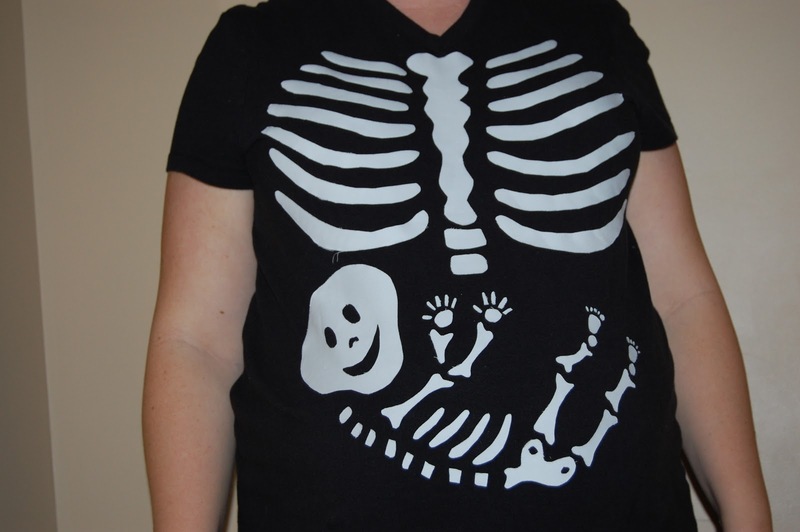 Last year, I saw this idea on Pinterest and knew if I was ever pregnant again at Halloween I would do it! My friend was pregnant with twins last Halloween and did one that was adorable! She even did legs and arms on her skeleton too! A lot of these use freezer paper to make these, but I just used the iron on sticky stuff (like wonder under). I ironed on the sticky backing to white fabric then traced my pattern on the back of the fabric, (though I was tired of tracing, and started just drawing to save time, my feet and vertebrates aren't perfect, but who cares?!) cut it out, and ironed it on. Simple!